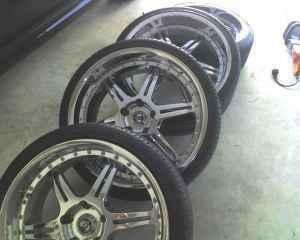 For sale is a set of wheels from 2003 BMW M3. This set is almost brand new. Will fit most BMW but check with your dealer. If you are going for the chrome you are going to love this set. The rims look new with no scratchs or dings. Asking for $1,550 and willing to negotiate. Shipping is not a problem at buyer's expense. I am located in Houston. The fronts are 19 x 8.5 (1.5" lip) with 255/35 Z R19 on them with about 85 - 90% tread remaining. The rears are 20 x 9.5 (2.5" - 3" lip) with 285/25 Z R20 with about 85 - 90% tread remaining. Tires are Pirelli PZeros Neros all the way around. They are over $280 each brand new.